On March 19, I had an opportunity to testify before the Senate Committee on on Commerce, Science, and Transportation. 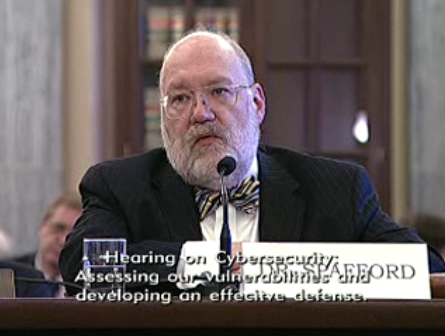 The hearing was entitled Cybersecurity -- Assessing Our Vulnerabilities and Developing An Effective Defense. I was asked to include information on research problems, educational initiatives, and issues regarding the current state of cyber security in the nation. As is usual for such things, the time between the invitation and the due date for written testimony was short. Thus, I didn't have the time to delve deeply into the topic areas, but could only address the things that I already had on hand -- including some posts from this blog that I had written before. The result was a little longer than the other statements, but I think I covered more ground. One hint for people testifying before Congress on such things: you can't depend on how long you will have for spoken remarks, so be sure any points you want to make are in your written testimony. In this case, the hearing was limited to about 75 minutes because there were several votes scheduled on the Senate floor, and the committee needed to adjourn to allow the Senators to attend the votes. And, as is common for too many hearings, there weren't many of the committee members present; I believe the hearing began with only two of the 25 members present, and some movement of members in and out to reach a maximum of four seated at any one time. In this case, the chair (Senator Jay Rockefeller of West Virginia) apologized to us several times for the low turnout. However, many (all?) of the staff and aides were present, so I'm certain the gist of the testimony presented will be considered. The Senator made a nice introductory statement. My written testimony is available on my website as well as the committee site. My oral statement was from rough notes that I modified on the fly as I listened to the other testimony (by Jim Lewis, Eric Weiss and Ed Amoroso). That statement, and the whole hearing, are available via the archived hearing webcast (my remarks start at about 46:30 into the webcast). If I get a transcribed version of those remarks, I will post them along with my written testimony on my website in the "US government" section. Comments by the other speakers were good overall and I think we collectively covered a lot of ground. The questions from the Senators present indicated that they were listening and knew some of the problems in the area. The comments from Senator Nelson about the intrusions into his systems were surprising: several Senate security staff were present at the hearing and indicated to me that his remarks were the first they had heard of the incidents! So, the hearing apparently set off an incident-response exercise -- separate from responding to my presence in the building, that is. Will this hearing make a difference? I don't know. I've been testifying and saying the same things for over a dozen years (this was my 8th Congressional hearing testimony) and things haven't gotten that much better...and may even be worse. Senator Rockefeller has indicated he intends to introduce legislation supporting more funding for students studying cyber security issues. There was some good news coverage of all this (e.g., FCW and CNet). I am told that there will be more hearings by this committee. Some House committees have been holding hearings too, and the President's 60 day review continues apace. The added attention is great, but with the sudden interest by so many, the result may be more confusion rather than resolution. As a reminder, if you want to know about my occasional postings such as this but don't want to subscribe to the RSS feed, you can subscribe to the mailing list. Also as a reminder, there is my tumble blog on security issues, with links to items on the news and WWW of possible interest to those who find my ramblings and rants of interest. As I write this, I’m sitting in a review of some university research in cybersecurity. I’m hearing about some wonderful work (and no, I’m not going to identify it further). I also recently received a solicitation for an upcoming workshop to develop “game changing” cyber security research ideas. What strikes me about these efforts—representative of efforts by hundreds of people over decades, and the expenditure of perhaps hundreds of millions of dollars—is that the vast majority of these efforts have been applied to problems we already know how to solve. Let me recast this as an analogy in medicine. We have a crisis of cancer in the population. As a result, we are investing huge amounts of personnel effort and money into how to remove diseased portions of lungs, and administer radiation therapy. We are developing terribly expensive cocktails of drugs to treat the cancer…drugs that sometimes work, but make everyone who takes them really ill. We are also investing in all sorts of research to develop new filters for cigarettes. And some funding agencies are sponsoring workshops to generate new ideas on how to develop radical new therapies such as lung transplants. Meanwhile, nothing is being spent to reduce tobacco use; if anything, the government is one of the largest purchasers of tobacco products! Insane, isn’t it? Yes, some of the work is great science, and it might lead to some serendipitous discoveries to treat liver cancer or maybe even heart disease, but it still isn’t solving the underlying problems. It is palliative, with an intent to be curative—but we aren’t appropriately engaging prevention! Oh, and second-hand smoke endangers many of us, too. We know how to prevent many of our security problems—least privilege, separation of privilege, minimization, type-safe languages, and the like. We have over 40 years of experience and research about good practice in building trustworthy software, but we aren’t using much of it. Instead of building trustworthy systems (note—I’m not referring to making existing systems trustworthy, which I don’t think can succeed) we are spending our effort on intrusion detection to discover when our systems have been compromised. We spend huge amounts on detecting botnets and worms, and deploying firewalls to stop them, rather than constructing network-based systems with architectures that don’t support such malware. Instead of switching to languages with intrinsic features that promote safe programming and execution, we spend our efforts on tools to look for buffer overflows and type mismatches in existing code, and merrily continue to produce more questionable quality software. And we develop almost mindless loyalty to artifacts (operating systems, browsers, languages, tools) without really understanding where they are best used—and not used. Then we pound on our selections as the “one, true solution” and justify them based on cost or training or “open vs. closed” arguments that really don’t speak to fitness for purpose. As a result, we develop fragile monocultures that have a particular set of vulnerabilities, and then we need to spend a huge amount to protect them. If you are thinking about how to secure Linux or Windows or Apache or C++ (et al), then you aren’t thinking in terms of fundamental solutions. I’m not trying to claim there aren’t worthwhile topics for open research—there are. I’m simply disheartened that we are not using so much of what we already know how to do, and continue to strive for patches and add-ons to make up for it. In many parts of India, cows are sacred and cannot be harmed. They wander everywhere in villages, with their waste products fouling the streets and creating a public health problem. However, the only solution that local people are able to visualize is to hire more people to shovel effluent. Meanwhile, the cows multiply, the people feed them, and the problem gets worse. People from outside are able to visualize solutions, but the locals don’t want to employ them. Metaphorically speaking, we need to put down our shovels and get rid of our sacred cows—maybe even get some recipes for meatloaf. Let’s start using what we know instead of continuing to patch the broken, unsecure, and dangerous infrastructure that we currently have. Will it be easy? No, but neither is quitting smoking! But the results are ultimately going to provide us some real benefit, if we can exert the requisite willpower.